Here's the secret of how ultra-conservative talking heads reconcile their activism with their stay-at-home values: They don't, really. The estimable Amanda Hess went to CPAC to try to figure out how it is that women like Michele Bachmann and before her, Phyllis Schalfly spend so much time away from traditional feminine roles to advance a platform of traditional feminine roles. For some of them, compartmentalization, or maybe prioritization, is the answer. But some of it just sounds like denial. "You know, people ask me, ‘Why is it always women taking on guys on the left?... It is fun to be a conservative. We have a great time. We have so much fun taking on the left." 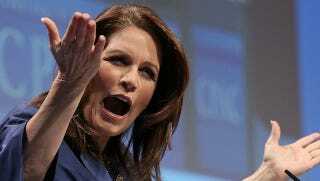 But "as much fun as we have in politics, don't forget about getting married," Bachmann says. "Women want to go out into the real world. But the real world is the world you create with your husband, and the kids you'll be privileged to bear. It is the greatest job in the world." Don't make your head hurt by wondering what job or world there is for women who don't want or can't have children, or can't marry their partner. Certainly there are women of every political stripe who would say they value their family above all else. But Bachmann seems oblivious to the fact that for most women, balancing those two worlds presents more challenges than it did for her. Some in her audience were more aware — one younger woman Hess interviewed said of Bachmann's ability to be a successful tax lawyer, mother of five, and then congresswoman, "And do you think that has anything to do with her having money behind her?" Stop with the jealous leftist class war! That doesn't belong at CPAC. There was more honesty about what's being suggested here in the words of Cleta Mitchell, a lawyer who's worked for Sharron Angle: "You can't have it all. Not at the same time. We live our lives in chapters, and that's wonderful." That sounds totally wonderful until you get to the part about "being called underqualified" and "ageism." Also, has it occurred to her that not everyone wants to wait? Speaking of CPAC: I would like someone to explain to me the origins of this "Feminist Messiah" thing that's tossed out in the below video, alongside snarling about Uncle Sam not being a sugar daddy to pay for your abortions. Is he our uncle or our daddy? Whatever, family first.